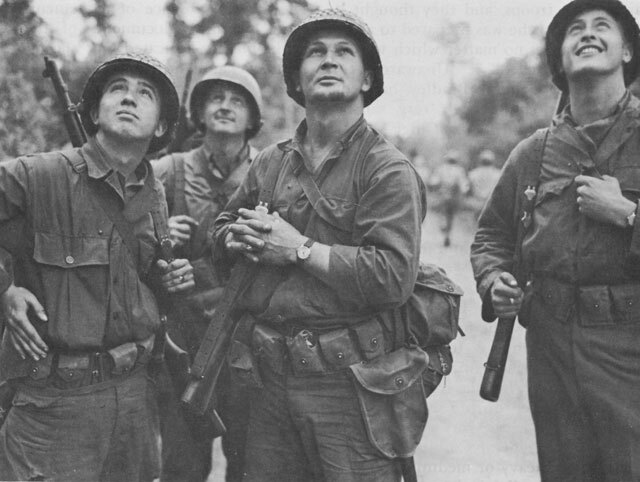 This page covers the fighting that followed the capture of St Lô and led to the succesful break-out from Normandy of the US First Army between July 20th and August 8th, 1944. There is a short description of the places and sites to see at the top of the page, with more detailed explanations of the history and where the sites you want to visit fit into the overall battle. With St Lô finally in American hands and access to the road network now opened up to a successful attack, the American front line ran in a roughly straight line from Caumont in the east, which had been captured in the first week of June, through St Lô up to Periers on the Atlantic coast in the north west. 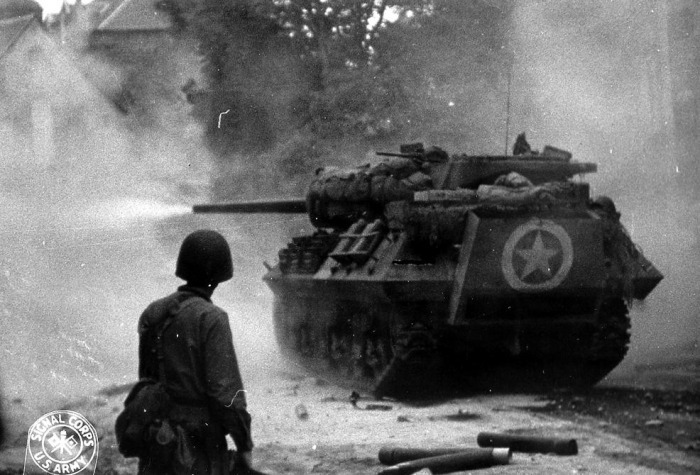 General Bradley the commander of the US First Army knew that General Patton's Third Army was assembling in Normandy behind the lines, ready to be unleashed when given the opportunity. Bradley was determined to do his best to give Patton that chance if he could. The Allies knew that the German situation was becoming precarious as Hitler issued more and more unrealistic orders to units that had, without fresh reinforcements, almost ceased to exist. Bradley thought that there finally was a chance that with one hard push the German front may well collapse and determined to find out if he was right. He decided to borrow an idea from the British that had been used in their assaults around Caen, namely heavy bombing of the enemy front line to be attacked, and chose the front line facing south across the Periers-St Lô road. Heavy bombing close to friendly lines was a very risky venture in 1944. The bombers needed 6,000 yards of clear space around their targets to allow for 'errors in bombing accuracy' and the myth that the airmen could 'drop a bomb in a pickle-barrel from ten thousand feet' had been proved to be just that- a myth. The heavy strategic bombers missed. A lot. Bradley decided to risk it and issued orders to the airmen to avoid this eventuality, countering the possibility of friendly casualties against the effect that 2,000 aeroplanes dropping 3,300 tons of bombs would have on the Germans. In order to successfully exploit the effects of the bombing it was necessary to follow up as rapidly as possible as soon as the last plane had gone and so Bradley only proposed pulled his front line troops back a little over one thousand yards from the German front lines. The attack was initially set for the 18th of July, but was postponed several times. On July 24th the attack was set to go, but cancelled at the last moment. Some of the bombers, already en route to Normandy, did not receive the call-back sign and went on to the target. 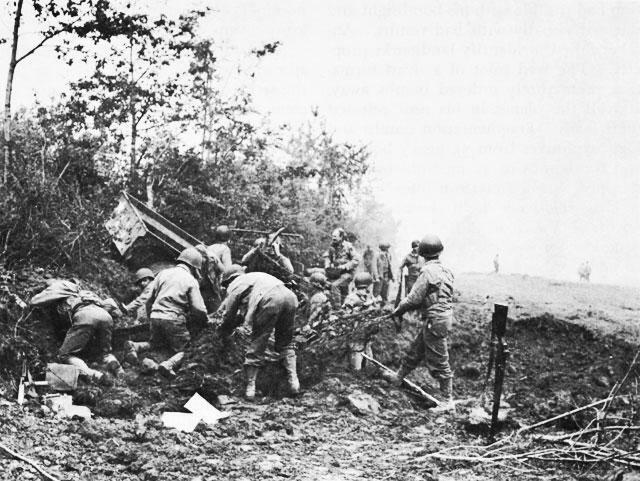 The fear of friendly casualties was borne out when several members of the 30th US Infantry Division were killed. The attack was re-scheduled for the following day. On the morning of the 25th of July the attack finally went in but friendly fire again resulted from bombing errors, this time causing more than 500 casualties with over 100 killed. But the bombing had indeed incapacitated the German Panzer Lehr Division in defense, destroying communications, upturning tanks, burying anti-tank guns, killing or wounding the defending German soldiers and in a lot of cases causing them to go mad craters from terror. 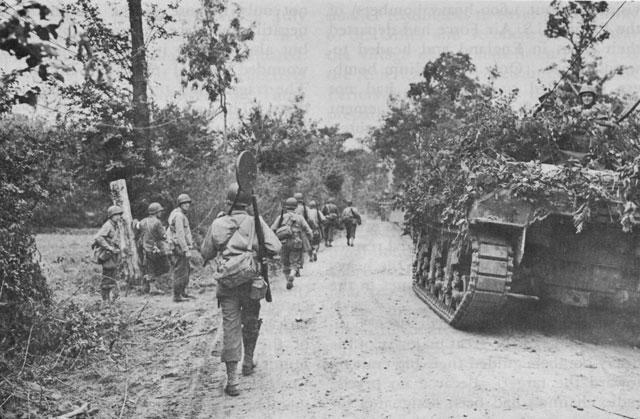 However, as they American forces started to advance they found the ground impassable even to the Armoured vehicles. The bombing had cratered the ground so badly that a lot of tanks fell into craters and were unable to get out. The road was also completely destroyed and the engineers got to work repairing them as quickly as possible.